1 Heat oven to 180C/fan 160C/gas 4. Butter and line the base of a round 20cm cake tin. Halve and stone 4 plums, set aside for later, then roughly chop the remaining plums. 2 Put the sugar, butter, flour, ground hazelnuts, eggs and baking powder into a large bowl and beat with a wooden spoon or electric hand mixer for 1-2 mins, until smooth and light. Stir in the chopped plums and chocolate, then tip into the prepared cake tin and smooth the top. 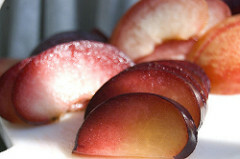 3 Arrange the halved plums over the top of the mixture, pressing them down lightly, then scatter over hazelnuts. Bake for 40-50 mins until the top is golden and the cake feels firm to the touch. Cool in the tin for 10 mins, then turn out, remove the paper and cool on a wire rack. Heat the jelly, then brush over the top of the cake before serving. Image courtesy of Rebecca Wilson on Flickr.